Who Is Precision Plating Company & What Do They Do? 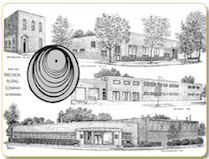 In 1904, after twelve years with Marshall Field and Company, our Founder, Robert Zacharias made certain that his new company, Precision Plating Company, would "Give the lady what she wants!" - the famous quote that Marshall Field's founder was known for. The Zacharias families made our clients feel that they were the most important part of the business. Please share in our 100 Year History and download our Anniversary book which was published in 2004. We strive every day to meet the value, scheduling and price demands that our industry and clients require. We judge our performance based on its merit, and constantly strive to be the best. Precision Plating Company has experience and expertise in the barrel, rack and reel-to-reel plating processes which make it possible to take performance and cost reduction to the next level. Precision Plating Company services, such as educational electroplating seminars, engineering consultations, quick-turn prototyping support, and troubleshooting using design of experiments, allow your company to keep a competitive edge in design, development and production of customer products.